Have These Scientists Discovered The Perfect Rooting Medium For Propagating Cuttings? If you have ever been frustrated with your rooting medium… or… you’ve been forced to make compromises in your garden because of the limitations of your rooting medium… then… you’re going to be thrilled with this new scientific breakthrough. 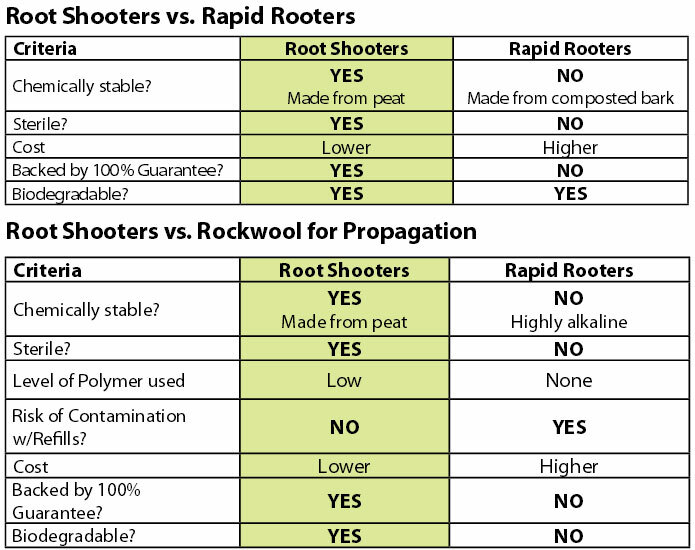 Root Shooters is the ultimate plant plug rooting medium for indoor hydroponics. It’s made of a peat based media with a proprietary binder holding it together to create the perfect blend of peat to air. This peat and binder combination helps avoid disease and pH issues you’d normally see with bark based mediums because in wet rooting situations the structural fibers of bark break down and clog out air spaces. This negatively affects the most important part of your plants – their roots – because you need proper air space for roots to grow quickly and fully in indoor rooting situations. Every grower knows that getting your plants to root faster… and… develop stronger, deeper and bigger root structures… directly translates to faster rooting plants, better quality crops and world-class yields. Because of the extremely uniform substrate and structure with hundreds of micro air pockets evenly distributed throughout Root Shooters plugs, you easily get extensive fibrous root growth throughout the full depth and volume of the plug. Plus, this superior structure gives you the ideal water holding capacity, while at the same time, giving you excellent drainage. This means you’ll see easier water management… your rooting medium never gets too wet (which helps avoid diseases and pests)… and greatly helps reduce losses, especially in over-wintered crops. And because there’s no net around the plug your plant’s roots will grow fully throughout the medium immediately after potting. Also, because your plant’s root systems are developed in the plug (and not outside of the plug) your plants will pot much quicker and are better protected against root damage, disease, and transplant shock is virtually eliminated. Because the Root Shooters Plant Plugs are supplied ready-to-use, you’ll see up to 20% faster sticking speeds compared to other discrete plugs … and … there’s no additional labor needed to fill or water trays unlike using loose-fill substrates. 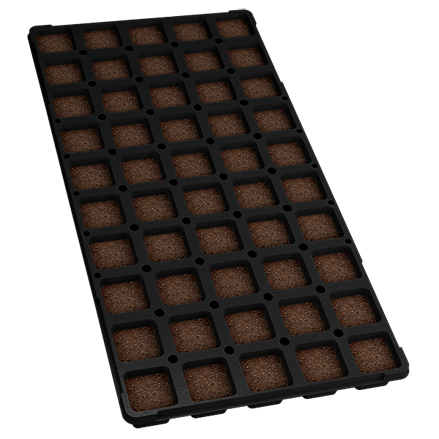 And extensive testing with the types of plants we grow and the gardens we grow them in has proven potting on speeds are much quicker than with other discrete or loose fill plugs, because the Root Shooters™ pull from the trays quickly, easily, and with amazing consistency. … And give your plants the absolute best rooting medium to develop strong, prolific root structures that directly translate into better quality plants and larger yields. But you don’t have to risk anything to try Root Shooters yourself. 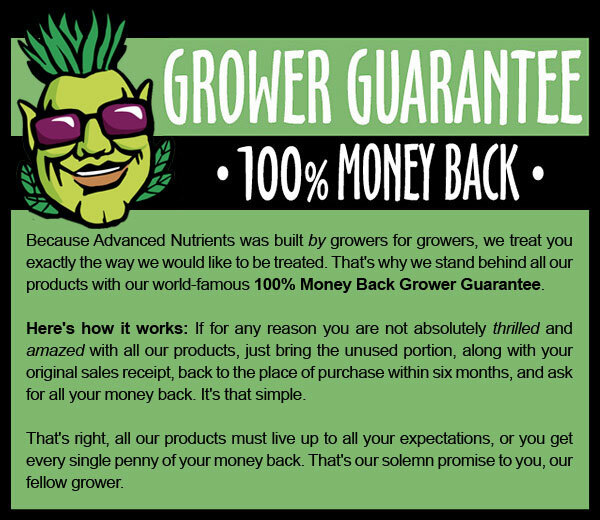 That’s because Advanced Nutrients offers a 100% money-back guarantee of satisfaction. Either you’re overjoyed and ecstatic about the difference Root Shooters™ makes in your grow room or you get every penny of your money back. It’s that simple. Before you start your next crop cycle, simply visit your nearest hydroponics retail shop and tell them you want to try Root Shooters risk-free in your garden immediately. Once you do that, you’ll be ready to go home and start your next crop cycle with this almost perfect rooting medium and experience all the benefits you’ve discovered today for yourself.